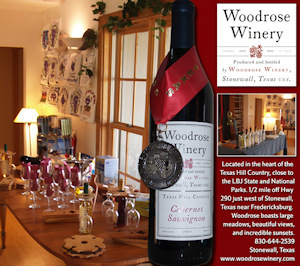 Woodrose Winery is located in Stonewall, Texas on the south side of Hwy 290 just west of Stonewall or 14 miles east of Fredericksburg on Woodrose Lane. Although Woodrose is one of the smaller wineries, they are expanding very quickly. The winery has been around since 2001 when the first vines were planted. In 2005 winemaker and enthusiast Mike Guilette bought the winery and 24.5 acres and is now taking the winery to new heights. Woodrose has offered a distinct personal experience and an unmatched quality in the heart of the Texas wine industry. Their wines range from refreshing whites, rosés and full-bodied reds to their expanding line of unfiltered reds and unique blends. Woodrose Winery makes a wonderful afternoon outing for any occasion. They pride themselves on providing a relaxing, delicious, and educational experience – from their back deck under the trees to a self-paced, seated wine tasting, to regular events featuring gourmet food from around the world specially selected to pair with their wine. They offer tabletop service for wine tastings. They come to you, while you relax, chat, and browse their ever-growing wine list. So, sit back, relax, and enjoy a glass of their outstanding wine. Don’t forget to stop by while you are in town or just passing by, they’re there to serve you!